"RAlt" redirects here. For the manufacturer of racing cars, see Ralt. The AltGr key typically takes the place of the right-hand Alt key. AltGr (also Alt Graph, or Right Alt) is a modifier key found on some computer keyboards and is primarily used to type characters that are unusual for the locale of the keyboard layout, such as currency symbols and accented letters. On a typical, IBM-compatible PC keyboard, the AltGr key, when present, takes the place of the right-hand Alt key. In macOS, the Option key has functions similar to the AltGr key. Sun Microsystems keyboard, which labels the key as Alt Graph. The meaning of the key's abbreviation is not explicitly given in many IBM PC compatible technical reference manuals. However, IBM states that AltGr is an abbreviation for alternate graphic, and Sun keyboards label the key as Alt Graph. AltGr was originally introduced as a means to produce box-drawing characters, also known as pseudographics, in text user interfaces. These characters are, however, much less useful in graphical user interfaces, and rather than alternate graphic the key is today used to produce alternate graphemes. Originally, US PC keyboards (specifically, the US 101-key PC/AT keyboards) did not have an AltGr key because that was relevant to only non-US markets; they simply had "left" and "right" Alt keys. Therefore, it is recommended that this combination not be used as a modifier in Windows keyboard shortcuts as, depending on the keyboard layout and configuration, someone trying to type a special character with it may accidentally trigger the shortcut, or the keypresses for the shortcut may be inadvertently interpreted as the user trying to input a special character. Note that many of these symbols can also be entered using dead keys; for example ä can be entered with " followed by a. For comparison, the US-International keyboard layout follows. Note that the "`/~" key (left of number 1) has been omitted; it doesn't produce any characters together with the AltGr key with or without Shift. € the Euro currency symbol. Located on the "4/$" key. \ the Backslash symbol. Located on the "#/~" key. Either |, the vertical bar ("pipe symbol") or ¦, the broken vertical bar ("broken pipe symbol"). Located on the "`/¬" key, to the immediate left of "1". The other bar symbol is the shift-keyed symbol on the "\" key immediately to the left of the Z key. The two latter symbols interchange places in UK keyboards according to the operating system in use. 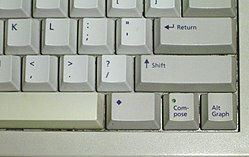 In OS/2, the "UK keyboard layout" (specifically: the UK166 layout) requires AltGr for the vertical bar and the broken vertical bar is a shifted key—which matches the actual symbols that are printed on most UK keyboards; in Windows, the "UK keyboard layout" requires AltGr for the broken vertical bar and the vertical bar is a shifted key—the reverse of what is usually printed on the keys; and in Linux, the "UK keyboard layout" produces the unbroken vertical bar with both AltGr plus "`/¬" and shifted \, and produces the broken vertical bar with AltGr plus shifted \. Using the AltGr key on UK and Irish keyboards in some versions of Windows (for example XP) in combination with vowel characters produces acute accents also known as "fadas" in the Irish language over the vowels (for example, á, é, í, ó, ú and Á, É, Í, Ó, Ú). The UK-Extended keyboard available in versions of Microsoft Windows from XP with SP2, and Linux allows many characters with diacritical marks, including accents, to be generated by using the AltGr key in combination with others. Details are to be found at QWERTY § United Kingdom (Extended) Layout. On Belgian keyboards, AltGr enables the user to type the following characters (the first or only one shown is without ⇧ Shift; when two characters are mentioned, the second one is with ⇧ Shift). Those shown in bold are printed on the keys, and common to all systems; the others may be more variable, or specific to Unix-like systems. For travellers who want to use hotel PCs or cybercafés in Belgium, it is important to know that @ in email addresses is generated by a combination of AltGr + é (unshifted 2). Note: Depending on the hardware, the latter key may also be two rows higher, with ← Backspace narrower and ↵ Enter wider to compensate. The AltGr+C combination results in the (obsolete) symbol ₢ for the former Brazilian currency, the Brazilian cruzeiro. The AltGr+Q, AltGr+W, AltGr+E combinations are useful as a replacement for the "/?" key, which is physically absent on non-Brazilian keyboards. Some software (e.g. Microsoft Word) will map AltGr+R to ® and AltGr+T to ™, but this is not standard behavior and was likely an accident owing to the fact that the combinations Ctrl+Alt+R and Ctrl+Alt+T were intended. Windows interprets Ctrl+Alt as AltGr. The Finnish multilingual keyboard standard adds many new characters to the traditional layout via the AltGr key, as shown in the image below (the blue characters can be written with the AltGr key; several dead key diacritics, shown in red, are also available as an AltGr combination). Windows 8 introduced the ability of pressing AltGr+⇧ Shift+ß to produce ẞ (capital ß). Even though this is usually not indicated on the physical keyboard—potentially due to a lack of space, since the ß-key already has three different levels (ß → "ß", ⇧ Shift+ß → "? ", and, as shown above, AltGr+ß → "\")—, it can be seen in the Windows On-Screen Keyboard by selecting the necessary keys with the German keyboard layout selected. There are several combinations using AltGr that activate hebrew vowels. Utilizing a Hebrew keyboard, one may write in Yiddish as the two languages share many letters. However, Yiddish has some additional digraphs and a symbol not otherwise found in Hebrew which are entered via AltGr. There is an alternate layout, which differ just in disposition of characters accessible through AltGr and includes the tilde and the curly brackets. At the time of the political transformation and opening of commercial import channels this practice was so widespread that it was adopted as the de facto standard. Nowadays most PCs in Poland have standard US keyboards and use the AltGr method to enter Polish diacritics. This layout is referred to as Polish programmers' layout (klawiatura polska programisty) or simply Polish layout. Another layout is still used on typewriters, mostly by professional typists. Computer keyboards with this layout are available, though difficult to find, and supported by a number of operating systems; they are known as Polish typists' layout (klawiatura polska maszynistki). Older Polish versions of Microsoft Windows used this layout, describing it as Polish layout. On current versions it is referred to as Polish (214). This use of dead keys enables one to type a wide variety of precomposed characters that combine various diacritics with either uppercase or lowercase letters, achieving a similar effect to the Compose key. In this diagram over the Swedish X Window key map, the grey symbols are the standard characters, yellow is with ⇧ Shift, red is with AltGr, and blue is with ⇧ Shift+AltGr. ^ Microsoft Support. "The Right ALT Key and the US-International Keyboard Layout". Microsoft. Retrieved 22 February 2013. ^ "Keyboard Technical Reference". ibm.com. ^ "IBM Globalization – Alternate graphic". ibm.com. ^ Kaplan, Michael S.: "To start press the ALTGR key." Hmm... where's the ALTGR key?. 28 December 2004. ^ The Old New Thing: Why Ctrl+Alt shouldn't be used as a shortcut modifier. 29 March 2004. ^ Raymond, Chen. "Why Ctrl+Alt shouldn't be used as a shortcut modifier". ^ SFS 5966 Keyboard layout. Finnish-Swedish multilingual keyboard setting. Finnish Standards Association SFS. 3 November 2008. ^ Kotoistus: Uusi näppäinasettelu = Status of the new Keyboard Layout Archived 27 July 2011 at the Wayback Machine. A bi-lingual (Finnish + English) presentation page collecting drafts of the Finnish Multilingual Keyboard. CSC – IT Center for Science Ltd. Page updated 28 December 2006.